My fail safe indicator that football season is just around the corner is that a lot more people show up for my touch football games. It’s probably more efficient to simply look at the NFL schedule. The schedule says the Vikings play their first pre-season game tomorrow night against the San Francisco 49ers and that tells me it’s time to get back in the swing of things with Minnesota Vikings Chat. The most important question to be answered this season is whether or not Christian Ponder is the Vikings long-term answer at quarterback. Though we caught glimpses of his potential last season, given the lockout, the poor state of the Vikings’ offensive line and the paucity of receiving talent, it was next to impossible to get a good grip on what we’ve got in number 7. Among those glimpses last season, we saw progress that offered hope for the future. But that progress was incremental. This year, Ponder has had a full offseason to learn Bill Musgrave‘s offense. This year, Ponder has had a full offseason to learn from his mistakes by dissecting the tape from last year in order to try to shore up the weaknesses in his game. This year, Ponder has had a full complement of offseason activities to practice plays and to learn the preferences of his receivers. This year Ponder will presumably enjoy more comfort on the blindside, protected as he will be by Matt Kalil, the fourth overall draft pick. This year Ponder has another big, inviting target in free agent tight end John Carlson. This year Ponder has an outside deep threat in free agent receiver Jerome Simpson. 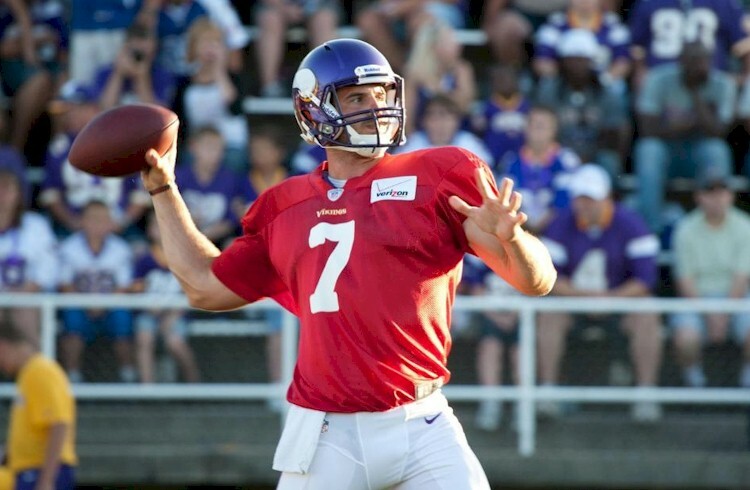 We should expect Ponder to make more than simple incremental progress this year. We should expect significant progress if we are to have confidence that we’re set at quarterback for the foreseeable future. The addition of Kalil should help improve Ponder’s protection a great deal, with Charlie Johnson sliding to guard, and John Sullivan coming off his best year. The biggest question marks are Brandon Fusco at right guard and whether Phil Loadholt will improve against speed rushers. Still, the offensive line should be improved. Though he won’t be available until the fifth game of the regular season, the addition of Jerome Simpson looks to provide the most glaring need we had among the receiving corps last year: A legitimate deep threat. Simpson is also an aggressive receiver who will go up and seize the ball in traffic. That characteristic is a reassuring crutch for a young quarterback who can enjoy the confidence that his receiver can come down with the ball despite being covered and that he doesn’t have to throw a perfectly placed pass to record a reception. That, apparently, is a characteristic Ponder will miss with the loss of Greg Child for the season. That’s too bad for us, Ponder, but most especially, of course, for Child himself. Our first peek at Ponder’s progress will come tomorrow night. I’m doing an experiment this season with Google Hangouts, the video chat feature of Google+. Every Thursday night at 7 PM CST, Minnesota Vikings Chat will host a video talk show about your favorite team at Google Hangouts. All you need to do is to follow Minnesota Vikings Chat at Google+, tune in at 7 PM CST Thursday nights, and, if you want participate, use a webcam. CLICK HERE to follow Minnesota Vikings Chat. The 49ers host the Vikings at Candlestick Park in San Francisco, California on Friday. Kickoff is at 8 PM CST and the game will be broadcast on CW, channel 23 locally. The radio broadcast is on KFAN-AM 1130/KTLK 100.3-FM locally with the same lineup. Pre-game show starts at 6 PM CST.